The Ark moves along swiftly from the very first chapter, capturing the reader's imagination." > The Ark by Boyd Morrison, a Mysterious Review. 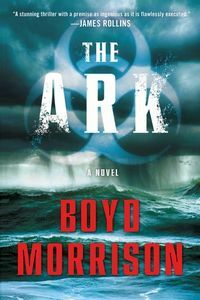 Review: Boyd Morrison's debut historical thriller, The Ark, is a remarkable account of how a small, dedicated — some might say fanatical — group can influence others to follow them, even if they don't know the true intent or scope … or consequences … of what is planned for them, and those determined to thwart their efforts. Dilara Kenner followed in her father's footsteps, becoming an archeologist, and though passionate about her profession, her goal was not as grand — or seemingly far-fetched — as his: Hasad Arvadi wanted to find Noah's Ark. But Hasad has been missing now for three years, presumably on his quest though no one knows for sure. Dilara's surrogate uncle, Sam Watson, summons her from her work in Peru to meet him in Los Angeles. He has word about her father. Within minutes of getting together, Sam becomes ill and dies in Dilara's arms, leaving her with just a few words: Tyler Locke, Gordian Engineering, Coleman, Hayden Project, Oasis, Genesis dawn. Not knowing where to start, Dilara goes with the only name mentioned by Sam. She discovers Tyler Locke working on an oil platform off the coast of Newfoundland. While flying to meet him, the helicopter in which she is riding crashes just short of the landing pad. Tyler is able to save Dilara and two other passengers, but the rest are lost. Was this an act of attempted murder, and if so, was Dilara the intended target? Now believing her father to be dead, Dilana enlists Tyler to take up his cause. Hasad's notes reference a mysterious scroll called the "Book of Treasures" that may be the key to finding Noah's Ark … and its secret, which, in its Biblical interpretation, could be used to kill virtually every person on the planet and start anew. The storyline in The Ark moves along swiftly from the very first chapter, capturing the reader's imagination, though it must be said that the plot is far more about preventing the terrorist release of a biological weapon than it is about finding the Ark. The villains are appropriately villainous, the heroes admirably heroic. With its credible inclusion of details to support (or question) various theses, The Ark is both challenging and inspiring, an effective combination for a thriller. Boyd Morrison is the author of three thrillers, all originally self-published before being acquired by Simon & Schuster. The characters in The Ark, in particular Tyler Locke, would seem to be a natural for a series. A sequel featuring this interesting and exciting engineer would be something to look forward to. Special thanks to guest reviewer Betty of The Betz Review for contributing her review of The Ark. Acknowledgment: Simon & Schuster provided an ARC of The Ark for this review.